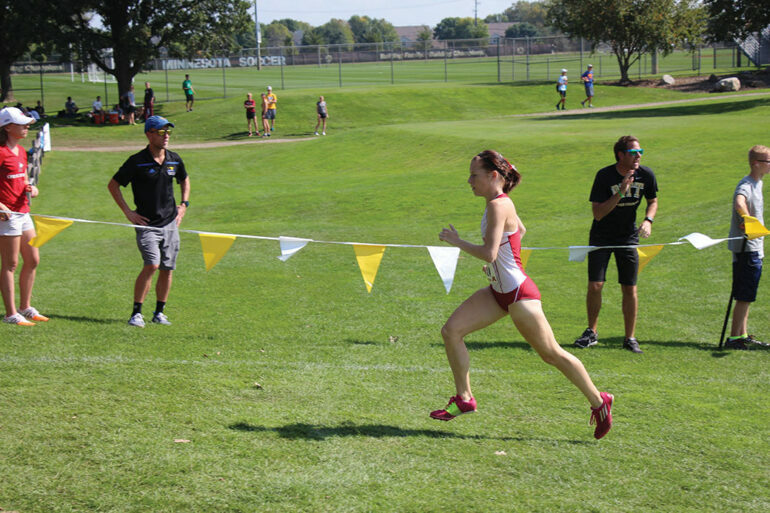 Competition in Peoria, Ill., proved to be another week of solid performances and improvements not only for the Coyote cross country teams a whole, but individually as well. The Newman Golf Course has historically been one of the fastest courses of the Coyotes’ season, and has produced a number of outstanding performances throughout the years. Senior Amber Eichkorn went wire-to-wire and won the women’s 6,000-meter race, while senior Mubarik Musa was able to come in at fourth place in the men’s 8,000-meter race to close out the regular season. Eichkorn and Musa both finished with personal bests, with Musa breaking his best time by just over 30 seconds and coming through the shoot at 24:09. Eichkorn clocked in at 20:11 shattering her previous time of 20:30. Eichkorn’s dominating run at the Bradley Pink Classic earned her her second Summit League athlete of the week this season, and her fifth of her career at USD. “I think I could have ran a lot better, I just didn’t perform how I know that I can” said Allen. Just about 20 seconds after Allen finished up, first-year Nate Wendt came barreling in. Wendt finished 117th overall with a personal best time of 25:39. In just a little over a month, Wendt has gone from running a 28:50 at Roy Griak, to a 27:01 at the SDSU Classic, and then to Friday running a 25:39. “Early on we expected him to do very well and he’s progressed nicely. He was dealing with the flu at the beginning of the season. But now he’s getting stronger, and we’re seeing the end result in that,” head coach Dan Fitzsimmons said. Just behind Wendt was sophomore Brice Cowman, finishing fourth for the team and 122nd overall clocking in at 25:42. Cowman topped his previous personal best of 26:20. Senior Katie Wetzstein ended up finishing second for the women and 21st overall with a seasons best time of 21:10. Senior Kelsey Barrett also had a season-best time, finishing third for the women and 57th overall. “All of us know we need to improve if we’re going to do well, but at this point we have a good ball rolling,” Allen said. The men ended up coming in 15th, while the women finished eighth overall. While the women have consistently finished in the top 10 at competitions throughout the season, the men have tended to fall into the mid-to-upper teens when ever going up against bigger schools. “The key thing and the only thing that we can control is improvement, and right now after the Bradley meet as a team we’re running the best we have all season,” Fitzsimmons said. Although both the men’s and women’s teams are near the top of the Summit League rankings, they still have a ways to go to place at the NCAA Regional meet coming up Nov. 13. If they do well, they will compete in the NCAA Championships on Nov. 21.